Shane Shirley : Behind the Green Fashion Scene: How We Are Helping Put an End to Toxic Fashion! Behind the Green Fashion Scene: How We Are Helping Put an End to Toxic Fashion! Zara Rocks and So Do You! Remember last week when I told you about Greenpeace and their petition asking Zara to take the toxic out of fashion? Well last week Zara, one of the world's largest fashion retailer announced a commitment to Detox! 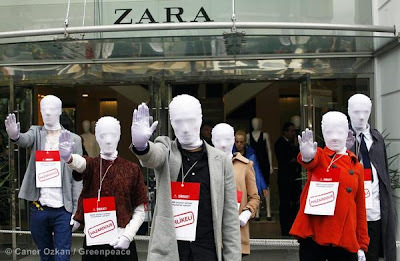 As part of Greenpeace's global "Detox" campaign last week, more than 700 people, in over 80 cities spanning 20 countries around the globe, protested by staging street theatre and conducting "mannequin" walk-outs to demand ZARA commit to eliminating the use of all hazardous chemicals throughout its supply chain. The participants, from Bangkok to Buenas Aires, also called on ZARA store managers to forward Greenpeace's Detox demands to their headquarters, after new research found traces of hazardous chemicals in ZARA clothing items, some of which can break down in the environment to become hormone-disrupting or even cancer-causing substances. It Worked! Zara Pledges to Eliminate Chemicals by 2015! After hearing from nearly 70,000 consumers who signed the petition, fashion power house, Zara, made the right decision to commit to a zero discharge policy. This means the company is adopting measures that will lead to no discharge of hazardous chemicals through its production process by 2020. But the news gets even better because Zara is showing their commitment to the health of the planet and her people by pledging to get rid of some of the most toxic chemicals even sooner than 2020. Zara has pledged to eliminate a highly hazardous and persistent chemical compound by 2015. Because Zara is one of the biggest fashion retailers in the world, where that industry giant goes, the others are likely to follow. The power of organized consumer protest with a specific call to action, such as signing a targeted petition, works. Don't ever let anyone tell you we can't make a difference in this world. We already are and the future looks bright! Thanks for flexing your consumer muscle!